If it weren’t for my kids (in particular, my youngest son), I probably wouldn’t get the Christmas decorations up until New Year’s Eve. Except of course for the Christmas Witch. Fortunately my son is not only very enthusiastic about decorating for Christmas, he’s also a control freak—a very energetic one. All I have to do is drag the decorations down from the attic. 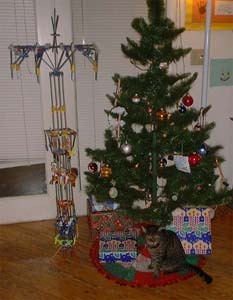 After that I go hide in the basement for a few hours, and when I come back upstairs everything’s decorated. This year we have a new tree. Our old artificial tree has a broken leg on its base, and it was not the best tree to begin with, so it seemed like a good excuse to get a new one. So sayeth my son, who is in charge of these things. “The base on this is broken. 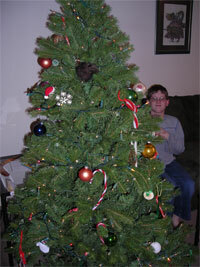 I think it’s about time for a new tree anyway,” he declared. In that little pause denoted by a comma, he disappeared and returned with his coat on. His “Okay!” overlapped my last few words. So now we’ve got a somewhat nicer artificial tree—we debated even getting a live one this year, but weren’t sure how we’d transport it home—and the old one is all boxed up and ready to take to the Thrift Shoppe. It’s beginning to look a bit like Christmas. Cold and Flu Season Word.